Pioneers in the industry, we offer animal print short kaftan, front open kaftan, digital printed kaftan, poly georgette kaftans, beach wear and beach wear short kaftan from India. Animal print short kaftan. 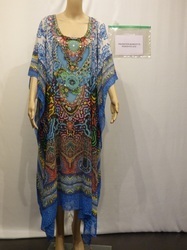 This kaftan can be worn as beach wear, on Jeans as a top. This Kaftan if on Polyester Georgette fabric. Front open kaftan on Pure Silk fabric. We can make it on pure silk crepe and viscose crepe. This kaftan is in Silk Crepe Fabric. Looking for Beach Wear Short Kaftan ?